On Sunday, June 15, 2003 representatives of the world-wide anti-Zionist Orthodox Jewish community will participate in the anti-Zionist march that will gather at 11AM at Old Northern Ave. Bridge, Boston. (Atlantic Ave. between Rowe's Wharf and South Station, by the James Hook Lobster Co.) for a march to the Boston World Trade Center, to protest the "Boston Celebrates Israel Festival". The Anti-Zionist Orthodox Jews will proclaim their loyalty to pure Judaism and their opposition to Zionist heresy, which violates every principle of the Jewish religion. These people shall proclaim that the idolatrous Zionist ideology has no role in the life of an Orthodox Jew, and that Jews are obligated by Judaism to live in peace and harmony with every other people throughout the world, including of course, the native Palestinian People. Pure Judaism proclaims that we are to accept the decree of Exile of G-d and live among the nations in every corner of the Earth, and are not to establish a State and attempt to end the divinely ordained Exile. 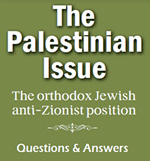 Pure Judaism forbids the uprooting of the indigenous people of the Holy Land, it proclaims its principles of humanity and justice that demands the total restoration of all human, civil, economic and political rights of the Palestinians, including the right of return of all Palestinians to their homes in historic Palestine, thereby enabling Palestine to be governed by its original native inhabitants. These principles are essential ingredients of Judaism, and no amount of Zionism brainwashing of many Jews throughout the world and Zionist media propaganda can ever do away with these eternal principles. We declare to all non-Jews who believe that support for Zionist idolatry and ethnic cleansing demonstrates sympathy for the Jewish People that this is a grave error!! Those of us who oppose Zionism express true compassion for the Jewish People because we address the ROOT CAUSE of the suffering in the Holy Land inasmuch as Zionism is the cause of bloodshed in the Middle East and hatred of Jews throughout the world.